Glycemic Index is an important consideration whenever choosing which foods to eat. Whenever sugar levels goes up in the blood it causes the body a large amount of work. With rapid rises in blood sugar, the body essentially goes into a panic mode to get the sugar out of the blood. The reason the body reacts so swiftly to blood sugar level rise is that sugar causes glycation of our proteins, cross-linking proteins and sugars with the result that the protein molecules don’t function perfectly anymore. This is a significant cause of cellular damage and aging. This is why diabetics statistically have reduced longevity and why diabetics have problems in so many areas — the proteins in diabetics’ bodies are constantly being damaged by sugar. The way the body gets sugar levels under control is to convert sugar to fat. Insulin is the hormone that helps this occur. There is a high degree of correlation between obesity and high blood sugar levels. Anytime the blood sugar is above 105, the body is going to be storing the excess sugar as fat (unless one’s cells have become insulin resistance, in which case, blood sugar rises and disease results). Bottom line: A major effort at keeping our bodies healthy is to keep our blood free of excess sugar. This is best done by eating predominately low glycemic foods, and to eat occasional high glycemic foods with a preponderance of low-glycemic foods and to eat smaller portions of food. Low glycemic index foods promote a slow to moderate rise in blood sugar and insulin as they're digested. Because of this, appetite is reduced and the body is actually encouraged to burn body fat. There are great benefits associated with eating virtually exclusively low glycemic foods. 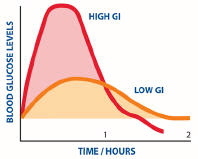 Foods that have a glycemic index value of up to 40 are Low Glycemic Foods. These are smart foods to eat because they don’t raise blood sugar quickly. Foods that have a Glycemic index value of between 41 to 55 are Moderate Glycemic Foods. These foods are generally safe foods in terms of not spiking blood sugar (except for people with insulin resistance). Foods that have a Glycemic index value between 55 to 70 are High Glycemic Foods. They are best eaten with low or very low glycemic foods in order to help slow blood sugar release; and to eat no more than two servings per day of these foods. Foods that have a Glycemic value above 70 are Very High Glycemic Foods and should be eaten no more than one serving a few times per month and always with low and moderate glycemic foods.